In water molecule, the oxygen is sp3 hybridized and hence has 4 sp3 hybridized orbitals. Two of these sp3 orbitals are half filled and hence overlap with 1s orbital of hydrogen to form two sp3 -s , O-H , σ bond while the other two contain a lone pair of electrons each. 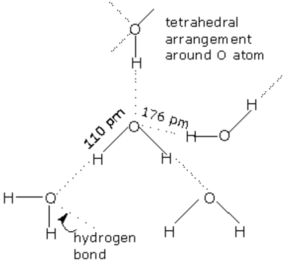 The geometry of water molecule should be tetrahedral and the bond angle ∠HOH should be 109.5° but experimentally it has been determined that the actual bond angle is 104.5°. In water, the oxygen atom is surrounded by two shared pair ,and two lone pair of electrons. 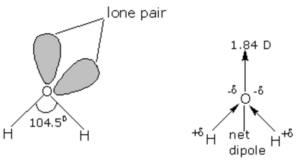 According to valence shell electron pair repulsion theory, lone pair- lone pair repulsion are stronger than Bond pair – Bond pair repulsion. As a result the bond angle in water is slightly smaller than the regular tetrahedral angle of 109.5°.The actual bond angle is 104.5° and each O-H bond has a bond length of 95.7pm. In the gaseous state, water exist as discrete molecules. 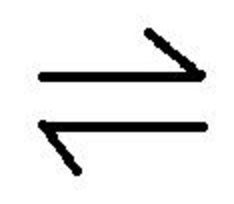 It is a bent molecule with bond angle of 104.5° and bond length of 95.7 pm. The electronegativity of oxygen is much higher than that of hydrogen and hence the shared pair of electrons in O-H bonds are attracted slightly more towards the oxygen atom. As a result oxygen carries a partial negative charge and hydrogen atoms carrier a partial positive charge. Since these two dipoles are inclined to each other at an angle of 104.5° therefore water is a highly polar molecule its actual dipole moment is 1.84 D.
In liquid state, water molecules are held together by intramolecular hydrogen bonds. Each oxygen atom can form two hydrogen bond by using each of its two lone pair of electrons.Each water molecule is generally hydrogen bonded to 4 other water molecules. Thus in liquid state water exist as an associated liquid. Liquid water consist of aggregates of varying number of water molecules held together by hydrogen bonds and free water molecules in a dynamic equilibrium with the aggregate continually forming, collapsing and reforming. When water freezes it ,forms ice which is the crystalline form of water. Depending upon the conditions employed for freezing of water, 9 crystalline forms of ice are known. At atmospheric pressure ice crystallises in the normal hexagonal form but at very low temperature it condenses in the cubic form. In the normal hexagonal ice, each oxygen atom is tetrahedral is surrounded by 4 other oxygen atoms i.e.there is a hydrogen atom between each pair of oxygen atoms. This gives ice an open cage like structure. Each oxygen atom is surrounded by 4 hydrogen atoms, two by strong covalent bonds and two by weak hydrogen bonds. Since hydrogen bonds are longer than the covalent bonds, the molecule of water are not closely packed in the crystal lattice. There exist a number of vacant spaces in the crystal lattice and hence the density of ice is lower than that of liquid water. When ice melts, some of the hydrogen bonds are broken and the cage like structure partially collapses.Some of the vacant spaces disappear which are now occupied by some of water molecules. Therefore for the same mass of water, the volume decreases and hence the density increases. The density of liquid water at 273 K is higher than that of ice and hence ice floats over liquid. As the temperature is raised gradually above 273 K ,more and more of hydrogen bonds break consequently , more and more water molecules start coming closer resulting in decrease in volume and hence increase in density. As the temperature is raised above 277 K ,the increase in volume due to expansion of liquid water becomes much more than the decrease in volume due to breaking of hydrogen bond. Therefore above 277 K there is a net increase in volume on heating thereby resulting in decrease in density.Hence density of water is maximum at 277 K.
Property of maximum density at 277 K helps aquatic animals to survive during winter months. In severe cold, the upper layer of sea water freezes while the water remains as liquid under the surface of ice. As a result the aquatic animals can live safely during severe cold weather. 1) The freezing point ,boiling point ,heat of fusion and heat of vaporization of water are abnormally higher than those of the hydrides of the other elements of the same group 16 such as H2S, H2Se, H2Te etc. This is due to presence of hydrogen bonding in water molecule which is absent among the other molecules. 2) Water has a higher specific heat, thermal conductivity and surface tension than most other liquids. These properties allow water to play a vital role in the biosphere. The high heat of vaporization and high heat capacity of water are responsible for moderation of the climate and body temperature of the living organisms. 3) Water because of its high dielectric constant has the ability to dissolve most of the inorganic compounds and therefore regarded as universal solvent. Solubility of ionic compounds takes place due to ion-dipole interaction, the solubility of covalent compounds such as alcohol ,urea, glucose ,sugar takes place due to tendency of these molecules to form hydrogen bonds with water. 4)Heavy water has slightly higher values of physical constant because of its higher molecular mass as compared to that of ordinary water. 1) Stability : Due to high negative heat of formation, water is quite stable at ordinary temperature but decomposes into its elements at very high temperature. The extent of decomposition is however, not appreciable. Even at 1500 K ,it is only 2%. Water also decomposes into its elements, when electricity is passed through it in presence of a small amount of acid or alkaline. Water is a weak electrolyte i.e. it undergoes ionization to a small extent to give H3O+ and OH‾ ions.As a result pure water has very low electrical conductivity. Water acts both as an acid and a base and hence is said to be amphoteric in character. It can act as an acid towards NH3 and a base towards H2S. Water can act as a base towards acids stronger than itself and as an acid towards based stronger than it. Auto-protolysis means self ionization of water. As an oxidising agents :Water reacts with number of active metals like sodium, calcium whose electrode potential is less than -0.83 V liberating dihydrogen gas. When steam is passed over red hot coke, syngas gas is formed. Water as an oxidising agent and hence itself gets reduced to dihydrogen gas. As a reducing agent: Water reacts with numb highly electronegative elements like fluorine whose electrode potential is higher than 1.23 V liberating dihydrogen and trioxygen. Water act as a reducing agent and hence itself get oxidised to either O2 or O3. During photosynthesis water is oxidised to dioxygen. Water can hydrolyse many oxides ,hydrides carbides, nitrides , phosphides and other salts. In these reaction, H+ and OH‾ ions of water interact with the anions and cations of the compounds leading to the formation of an acid or a base or both. The hydrolysis of sodium carbonate produces a strong base(NaOH) and weak acid (H2CO3) therefore aqueous solution of sodium carbonate is alkaline in nature. The hydrolysis of copper sulphate produces a weak base (Cu(OH)2) and strong acid (H2SO4) therefore an aqueous solution of copper sulphate is acidic in nature. Many ionic compounds crystallise from water with one or more molecules of water associated with them. This water in combination with ionic salts is called water of crystallisation and such crystals are called hydrated salts hydrates or hydrates. 1)Coordinated water : Water molecules are coordinated to the central metal ion to form complex ions. For Ex: Nickel nitrate hexahydrate, ferric chloride hexahydrate, chromium chloride hexahydrate, the six water molecules are linked to central ion Ni2+, Fe3+ , Cr3+ ion by co-ordinate bonds. 2) Hydrogen bonded water : Water molecules are linked to some oxygen containing anions by hydrogen bonding. ion by co-ordinate bond while 5th water molecule is linked to sulphate ion by hydrogen bond. 3) Interstitial water: Water molecules are present in interstitial sites or voids in the crystal lattice.In barium chloride dihydrate, BaCl2·2H2O ,the two water molecules occupy the voids in the crystal lattice.